Can Someone ID this type of connector? I found a Bearcat BC-60 XLT-1 scanner locally for the right price and want to eventually put a better antenna on it but it has an odd BNC connector. I went to Radio Reference but the guy that answered my post says its a BNC male, but that style does not fit. I snapped a photo in hopes someone can tell me what the connector is so I can either get another antenna or an adapter to change it to SO-239 or F. Thanks. Re: Can Someone ID this type of connector? Is that one of the old jacks that used to be used on a lot od old test items like the RCA voltohmist? I think it was a amphenol mic type connector. Need a clearer picture...could even be a TNC. N7ZAL wrote: Need a clearer picture...could even be a TNC. I believe you're right, but also agree we need a clearer photo. You could just try a TNC and let us know. Here is the top of it from the web. Looks like a hand held type of radio. It does look like a BNC connector. I wonder if it is a special made connector just for the bearcat? Not that any company make something special so you can only get it for them. That's a TNC......very much like a BNC. I was thinking the TNC connections were threaded. the scanner link I posted doesn't look like it is threaded. What am I missing? I don't think I have done much with TNC. We use to use a connector similar to TNC on the old IBM system 36 computers. The big difference is the size was about as round as a nickel and you had two pins in the center. Scanners do typically have BNC connectors. All of the Uniden Bearcat scanners that I've ever seen have BNCs. It looks to me like part of the female side broke off and is stuck inside the connector. Willy, you are correct, TNCs are threaded. 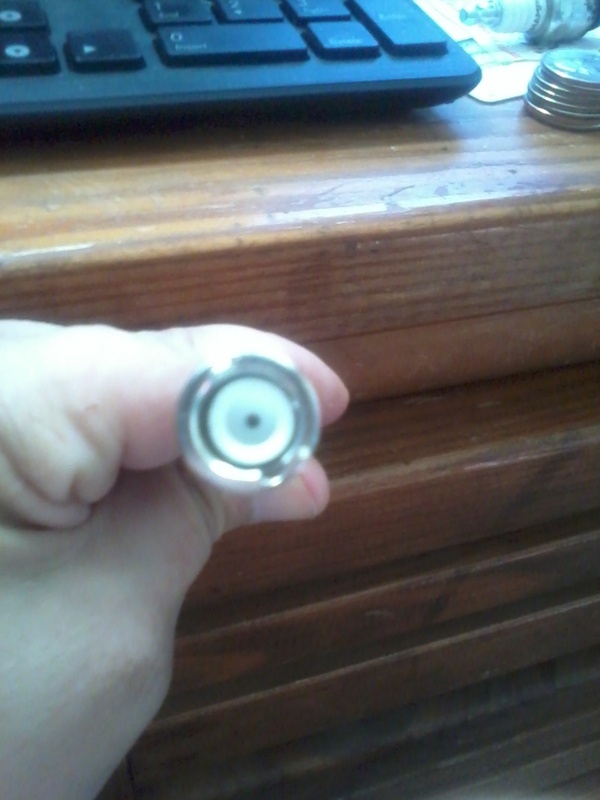 It's a BNC, and looks like the center pin is missing, but it's not. I have a BNC to F connector that will not fit on the scanner. I had it on my last bearcat scanner but that was a newer model and a base model. I know what a TNC is and it's not a TNC. TNC's are usually the connector on a wireless router and adapter antennas. If it is in fact broken, I can't seem to remove the piece from the scanner as I tried. If I would of known this when I was looking at it before purchasing, I would of not bought it since I didn't have 30.00 to spend on a broken scanner. It still has OK reception but I think it would be improved with a better antenna, which I probably won't be able to change. Can you replace the BNC connector? I have not worked on this type but I have replaced BNC and other connectors. I probably could, but it would not be an easy task or worth the effort. That scanner is about 15-16 years old so I have no plans to do any repairs or modifications to it. If I wanted to I could likely sell it as is on The 'bay for more than I paid for it but I will keep it until I can afford something newer.